Use TB3AFTZ to reference this item. 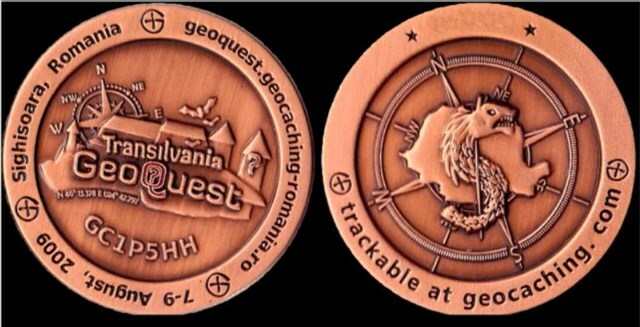 Transilvania GeoQuest (GC1P5HH) was held in Aug 2009. Ancient bastions, towers, walls, streets, stairs and squares, bourgeois houses, old monasteries and churches, craftman's workshops and bridges. Experience geocaching in a medieval town, chasing riddles in the middle of Transylvania's hills... . 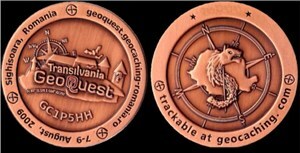 This coin was stolen by <a href="http://www.geocaching.com/profile/?guid=4e3fafde-5121-4963-b0c8-398a84988710">rgg24u</a>. Fond this while in town w/my Brother Grahamcracker 2. Will help it with its travel when I return to my home state of NY. Great coin. Will move it along in the near future.